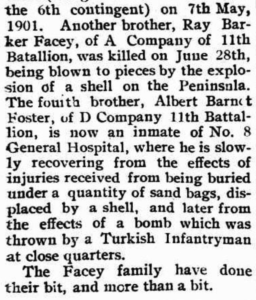 Albert Facey was wounded in his back by shrapnel and died a few minutes later. Buried where killed with eight others in two separate graves, one grave with four bodies and the other with five bodies. The bodies were buried by denomination, one containing Roman Catholics and the other Protestants. 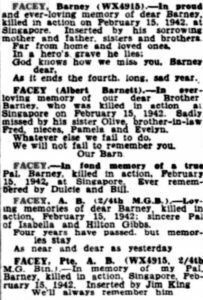 Albert Barnett (Barney) Facey born February 1919 was named after his father Albert Barnett Facey (Snr). Albert (Snr) was born 1894 Victorian Goldfields married in Bunbury 1916 to Evelyn Mary Gibson born Bunbury 1987. Barney was the eldest of their children who included Barbara, Joseph, Shirley, Eric and Olive. 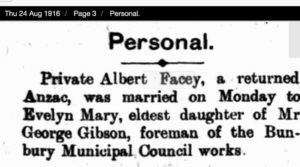 Albert (Snr) was youngest of seven children born to Joseph Thomas Facey and Mary Ann Carr, both born Castlemaine, Victorian Goldfields. The Lacey family moved to Kalgoorlie sometime after the birth of Albert (Snr) in 1894 and 1896 when his father Joseph Thomas Facey died of typhoid fever at Kalgoorlie, aged 40 years. He was buried at Kalgoorlie Cemetery. This left Albert (Snr’s) mother Mary Ann Facey (nee Carr) a widow with seven children, the youngest being Albert (Snr) about 2 years of age and the eldest, a son named after his father about 13 years. Vern Garth Facey b. 1885 Victoria d. 1951 WA. Laura Adelaide Facey b. 1887 Victoria d. Victoria 1960. Eric George Facey b. 1888 Victoria d. 1953 WA. Myra Kean Facey b. 1892 Victoria d. 1911 WA. Albert Barnett Facey b. 1894 d. 1982 WA. This would be a challenging time for Mary then living in Perth. Mary Ann died in 1914 aged 51 years. Downie was born in Roebourne. Mary Facey’s mother Emma Jane Carr who died in 1932 outlived her daughter. It was Albert (Snr’s) Grandmother Emma Carr who became carer of her daughter’s children, as their mother Mary Facey deserted them (according to Albert Snr’s writing). Albert (Snr) was out working at about 8 years of age undertaking a variety of manual jobs. He taught himself to read and write when he was older. At 18 years he was an accomplished bushman and boxer. When Albert (Snr) enlisted for WW1 in 4 January 1915 he recorded Arthur Thomas Downie of 1244 Hay Street, West Perth as his NOK. Emma Carr was mother of seven daughters most of whom remained living in Victoria. 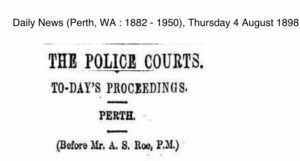 Emma’s husband died in 1901, Victoria and it is possible she then moved to WA to assist with Mary Facey’s family. A daughter of Emma’s by name of Elizabeth Carr married in Victoria to George William Facey who is younger brother to Albert (Snr’s) father Joseph Thomas Facey. Two Carr sisters married two Facey brothers. When WW1 broke out, Albert (Snr) and two of his older brothers enlisted. 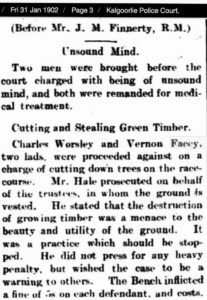 His eldest brother Joseph Thomas Facey (Jnr) and probably better known as Joe, had already served in the Boer War where he had been seriously injured and survived. Joe joined the Bridgetown 10th Light Horse and enlisted for WW1. Above: Vernon is older brother to Albert Snr. Vernon died WA 1951. Tragically Joe was KIA at Anzac Cove. He had been a high-spirited young boy as seen below. Above: should read J.T. Facey. 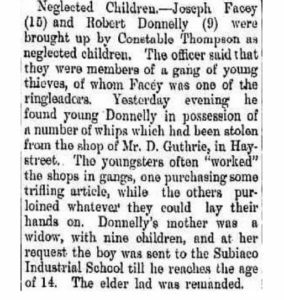 Joe Facey died September 1915, a few months after his younger brother Roy. A Government Industrial School was established in 1893 at Claisebrook, and moved to Subiaco in 1897. It was originally for girls, and was then used for older children and for the ‘temporary reception’ of children awaiting other placements. By 1902 it was called the ‘Government Industrial School and Receiving Depot’ and by 1907 it was known as the ‘Government Receiving Depot’. 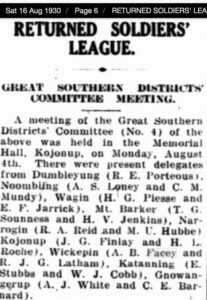 Above: June 1908. 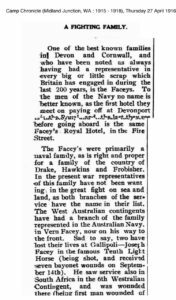 It is now several years after he served in Boer War, and Joe Facey remains quite a larrikin. 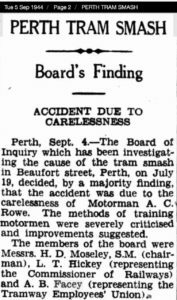 The above notice is from Mrs J. Carr – Albert (Snr’s) grandmother Emma Jame Carr. Roy Facey was married with a young son when he was KIA at Dardenelles in June 1915 aged 25 years. 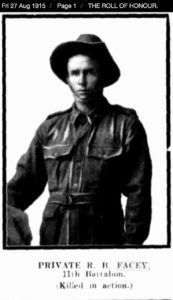 Albert (Snr) enlisted 4 January 1915 aged 20 years also with 11th Battalion, 4th Reinforcements. He was 6 feet tall and his Service No. 1536. Albert (Snr) was invalided back to Australia in 1915. He met his wife-to-be while recuperating. 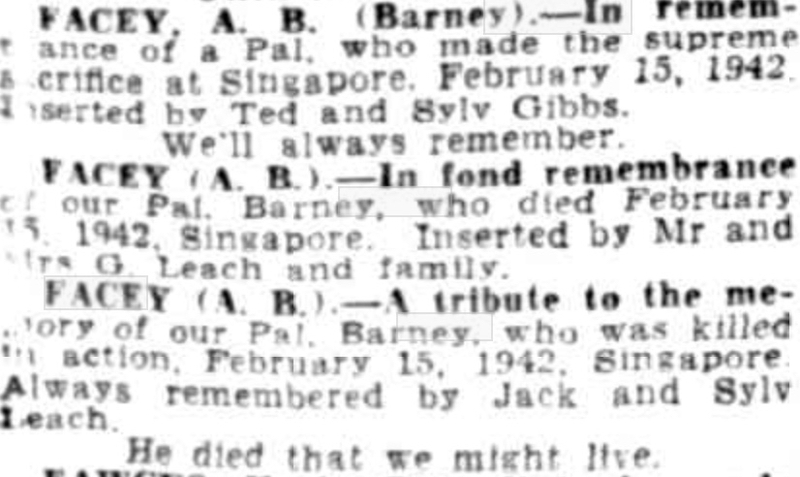 After the war, Albert (Snr) acquired a War Service Farm at Wickepin where several of Barney’s siblings were born. The family settled into the community and the 1925 Electoral Roll records show Evelyn and Albert (Snr) at ‘Oak View’, Norman’s Lake (near Wickepin). Albert (Snr) was involved in cricket, football and continued his participation with boxing and other community events. With the depression the Facey family were forced to leave their farm and return to city life where Albert (Snr) gained employment with the Tramways. Again he became involved with the community. 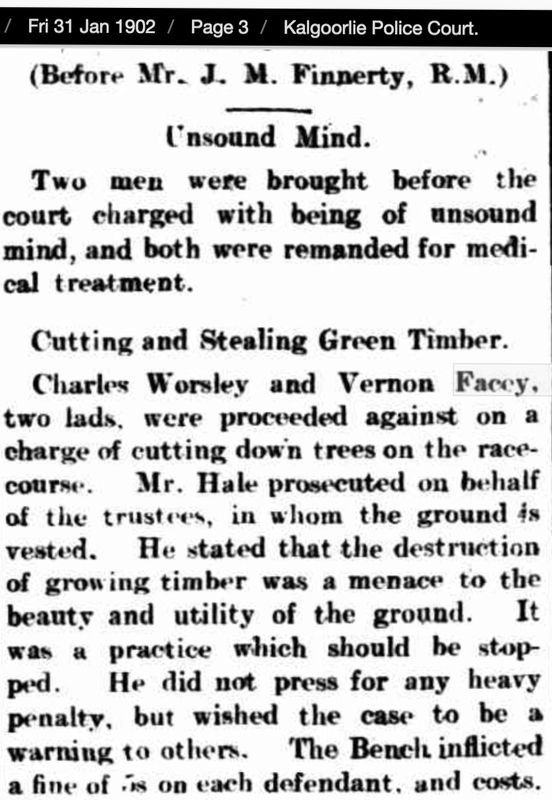 He was Tramways Union representative for other members and began an interest in local council. 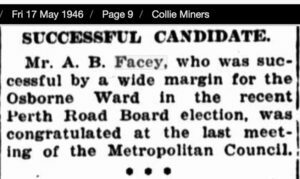 Albert (Snr) was to be elected to several Road Boards including Osborne and Wanneroo. When Barney enlisted in July 1940 he was working with his father at Osborne Park where they were establishing a market garden and Barney was a truck driver. Barney became a Driver with ‘A’ Company. He was 23 years of age when he was KIA at Cemetery Hill, Buona Vista, Singapore. 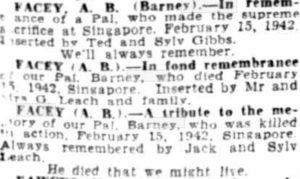 Barney’s name is included on the WW2 War Memorial at Wanneroo. It is strange that in three generations of Facey family that two eldest sons named after their father died at war. Joseph Thomas in WW1 and Albert ‘Barney’ Barnett in WW2. 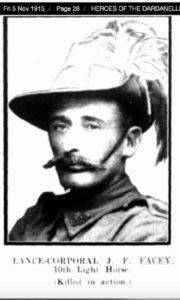 Barney’s uncle Roy Barker Facey who died with 11th Battalion Dardenelles in June 1915, named his first born child/son Roy Barker Lydiard Facey.